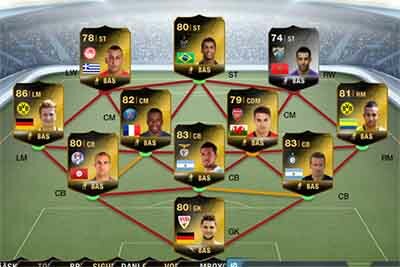 Every week EA gathers the players that stood out and places them in a single team: the FIFA 14 Ultimate Team TOTW – Team of the Week. Here we show you all the TOTW for FIFA 14 Ultimate Team. This article is updated every Wednesday with the new Team of the Week. 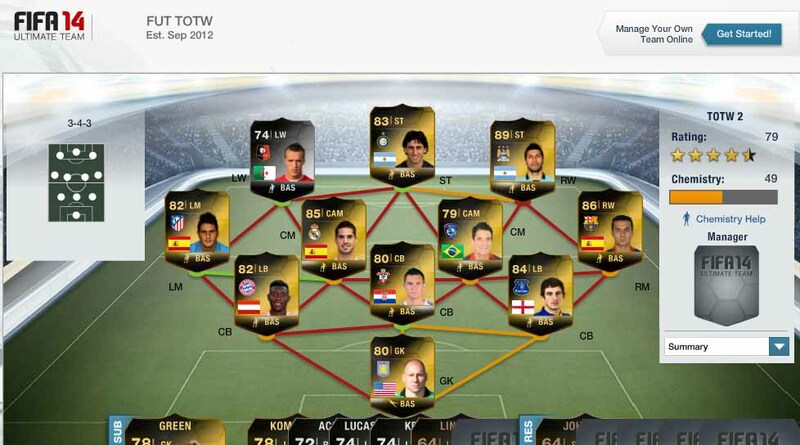 hi,admin.. i playing fifa 14 ultimate team android, it had been few weeks i can’t playing…my account is “livercys”. i hopes you can help me solve this problem as fast as possible…thanks!!!! However, you should pay attention to their work rates. Dani Alves is too attacking for most of the gamers. what time does the totw come out in Nevada, united states ? TOTW comes out at 11am in Nevada, US. Hi do you think IFs are worth the money? for example is aguero worth the extra coins? IF cards are too expensive. And In Game stats show us that they are not as good as their cards says. Always try to use a NIF card and only go to a IF card if there is no other choice. what time does totw players come out at Perth, Australia time? 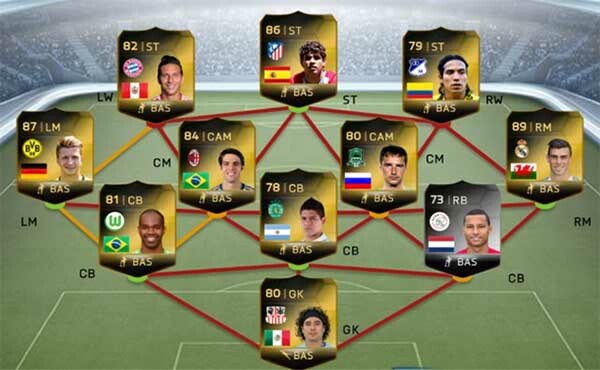 how much money is recommended to have when you buy these players? The players are announced at 20:00 and come out at 23:00 (Perth time). How much money ? It depends of what player do you want. So now…do you think IF Sokratis or UP Boateng is 2nd best bundesliga CB now? OK, now Sokratis is better but it pay attention to his dangerous work rates. Will do. Since i play 352 or 3412 i am going to upgrade from Hummels UP Boateng and Sokratis to Hummels UP Boateng and IF Sokratis. Next is IF Adrian Ramos for Aubameyang, then Robben, then SIF Lahm, then SIF Lewandowski or Ribery. Hey Rodrigo, really love your articles! I have an Argintine team on PS4, FIFA 14. Over time, as I could afford them, I replaced my wings and attackers’ NIF cards with higher rated IF versions. However, it seems to have hurt me as I’ve fallen from division 4 all the way down to division 8. My son suggested that EA penalizes your team if you have too many IFs on one squad. Is this the case or do you have another explanation for how adding improved players has resulted in a worse record? I would really appreciate anything you can share. It is not true that EA penalizes your team if you have too many IF cards on one squad. There are many speculation about this kind of myths. It is easy to find people to talk about handicap, scripting, momentum and other things like this but nothing was proved until today. IF cards are not the wonderful cards that gamers think to be. The In-Game stats show us that the IF cards are slightly better than the NIF ones. I appreciate your response and was surprised to see that the IF, in-game stats are so highly discounted from what’s advertised when I spent on the coins on them. It seems to be a fraud perpetrated by the makers of the IF cards themselves. Last night I had in game chats w/ several of the people I was matched with. All were in divisions at least 2 levels higher than myself, and even one that claimed to be 4 levels above me. What is the purpose of divisions if it’s not to keep matchmaking competitive? Actually, the in game stats can show a player to be better than previously thought. For example, TIF Hazard 91, which has a pace listed of 91, has equal or better stats in all the components of pace. Many other IFs experience the same phenomenon. Aquilani SIF has much better passing than listed, Ribery has amazingly good in game pace that isnt shown in the 95 listed, etc. Don’t forget that individual chemistry and chemistry styles are affecting the IG stats you see. he estado buscando de informarme sobre una cosa en concreto pero no he sido capaz de verlo en ningun lado. Es posible obtener una carta de un jugador TOTW pero de alguna semana anterior?? 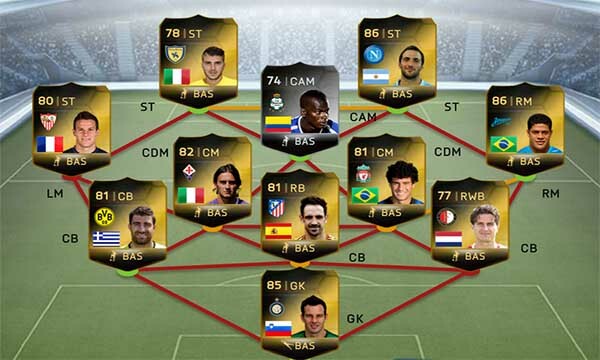 Por ejemplo, es posible obtener a Benteke (TOTW 25) cuando ya ha salido TOTW 26?? Y por último, he visto que alguno jugadores tienen cartas azules con un aumento considerable de los atributos, estas cartas especiales tmb se pueden obtener abriendo sobres?? No es possible obtener una carta de um jugador TOTW de una semana anterior. No es possible obtener una carta de um jugador TOTY ahora. Solo en la semana de TOTY que ha passado. There is so many things to test. Thank you very much. I will try to get one of those devices. I have bought unto 30 packs for 7.5k not a TOTW player best player i had was ashley young and simon mignolet ? is it just bad luck or what ? It is normal. We explained that very well in a good article we have published. Check it HERE. Hi Rodrigo, it is ont the good post but the post for iOS devices is closed. I have Ipad and 2 problems – i don’t see save bouton for the replays, only facebook or you tube – how to save replays without to save them online? And the second is very strange – when i play a match in online season AND i’m guest, after finishing the game I have the adversary team and not mine. I can then play with that team next matches upon reloading the game. Is it a glitch? There is a reason to have the comments of that post closed: we don’t have any device to test the FIFA 14 mobile. So, it is impossible to us to answer to most of your questions about this topic. Sorry, but we don’t know the answers to your questions. its always happend when i quit online season Match, and go to play an offline match. i get my opponent Team. and yes. the only way to save replay on IOS to upload on Facebook or Youtube. Because he is really good. It is released in packs at 7 pm every Wednesday. Because it was a agreement between Microsoft and EA Sports. It is exclusive for XBox. Maybe next year, who knows ? TOTW comes out in packs every Wednesday at 7am. If you are a PS user, forget it. Legends cards are only for XBox. Kaka, Wilfried Bony, Daniel Agger, Oscar and Alexis Sanchez. The best time is when they are playing, before they be included in TOTW. You have a full explanation of what you are asking HERE. Thank you for your reply. I was actually searching for that guide but I couldn’t find it. That cleared half my doubt, but I think you misunderstood my question, because how can I buy a TOTW player before it is included in it? Also there a few questions I have but, I wouldn’t want other people to see it. Is it possible to ask you those anyhow? Hi why do I get nothing good in a pack EVER. Because you missed our packs guide. Click HERE to read it. You will know all the truth. I just got Helmes (80) in a pack, how do you reckon he is worth I can’t find a price anywhere? 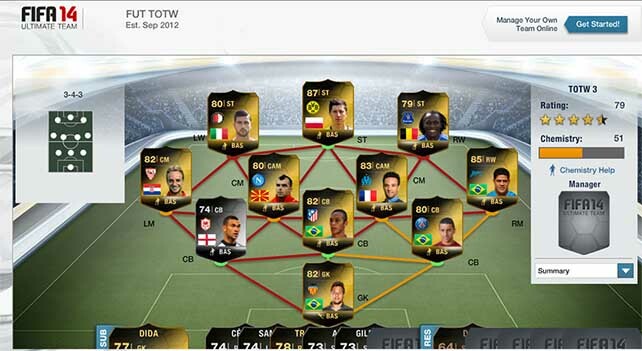 Go to our FUT 14 Hub HERE and click on one of the databases. i used to buy and sell navas, then suddenly his prices went up, i noticed that was during the time he was on totw, is it because of that? also usually when do the prices get back to normal? or they dont? On the last days, prices went up. Now, they are decreasing again. Boas, se eu comprar uma carta a outro jogador que lhe tenha saido terca feira e esse jogador na quarta sair na equipa da semana ele passa a IF? Não. As cartas nunca mudam. Terá de comprar a nova carta. … Today I noticed a gold card with a silver stripe on the rating, this card had increased stats on its card vs other gold cards, how does this happen, how can one receive the silver stripe and increased attributes? Someone has applied to that player card a training card. His new stats only last fone match. All you need to know is HERE. Share this site with your friends. ao sair o ultimo totw (ontem) comprei 3 diego tardellis por 20k cada (o BIN dele tava em 26-27k), porem hoje o preco caiu para 17-18k… o que eu faco? vendo mais barato ou espero valorizacao semana q vem? Depende do orçamento que tiver. Se puder aguentá-los mais um pouco era melhor pois os preços agora estão muito em baixo em virtude do lançamento do jogo para PS4. 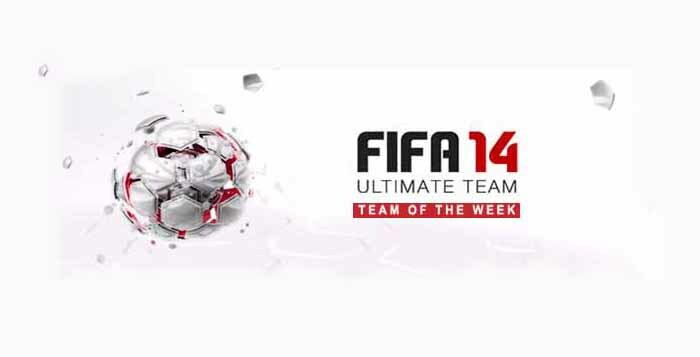 Hi Rodrigo, at what hour does the new TOTW came out today(UK TIME)? It is announced at 3pm and the cards are released in packs at 6pm. 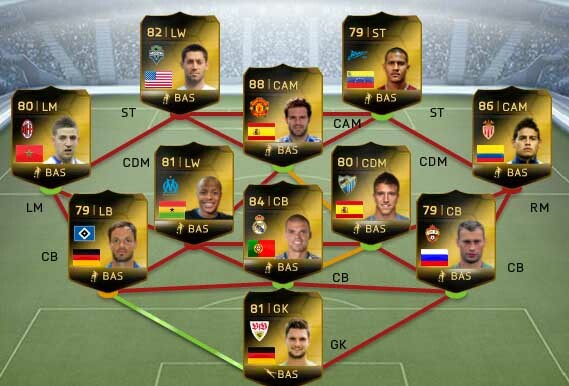 Pogba became TOTW this time and however i have his card there is no changes. What is the reason for this? Why did his card remained the same? Thank you in advance for your feedback! IT is normal. Your cards don’t change. If you want Pogba with better attributes you will need to buy his new card. You will understand better, reading THIS guide. Your chances of getting an IF card are always the same., even during Happy Hours. The only exception is the HH announced as 2x chance, in which your chances are 2 times higher.